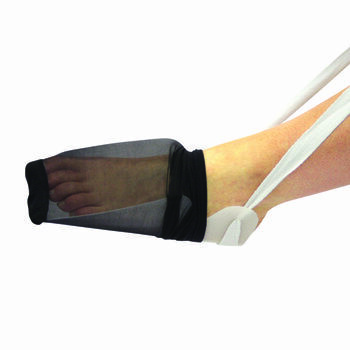 Assists with putting on stockings or socks when bending and reaching the foot is difficult. Consists of a strong, shaped and flexible plastic gutter with long cotton tapes attached to the top. Stocking or sock is fed onto plastic and held in place by the side notches. It is then placed on the floor and foot is put in the open end of the stocking, which is pulled over the foot and up the leg using the tapes.